Planet Salem: the international Salem Al Fakir fansite! : SALEM TILL GLOBEN !!!!! You did the right thing and sent Salem to Globen. Tonight I am so happy and can't stop smiling! I thought Salem's performance was terrific, the song is wonderful and this is just one of the happiest nights ever. Edit 07.02.10: my full review of last night's contest is over at my other blog EuropeCrazy. Enjoy! Jag är så glad att jag kan inte beskriva det!!! Så sjuukt gött är det.. 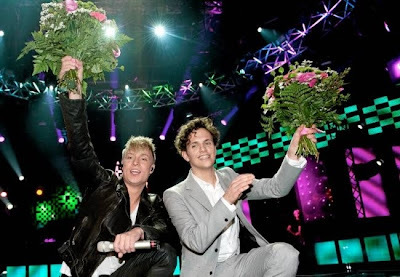 I am so extremely happy for you for tonight's victory in the first part competition of the Swedish Song Competition 2010, you took the no. 1 position going straight on to Globen. Great performance, great music, great lyrics. AND YOU ARE ONE OF THE BEST ARTISTS EXISTING ON THIS PLANET, TRULY UNIQUE, Plzzz Salem, for the Global event, suggest you wear black trousers and shoes, white shirt and some blazer in a bright colour, festivity look, could be a strong colour and some silver sparkle on that same colour. You are a colourful artist and person, and needs to dress with a jacket of colour as you perform to match your character and personality. Whenever you perform, think Show, Las Vegas, Colours, Glamour, Festivity....and choose your cloths accordingly. Your plain grey blazer today, a good blazer maybe but for some business meeting, not for a SHOW. Your hair and looks tonight apart from the blazer, YOU LOOKED FABOLOUS, ALL PERFECT, JUST PLS CHANGE THE OUTFIT as mentioned above. The outfit adds to the performance, and to the voting points for a general impression of the show of a person. Missed the real thing yesterday, because of a birthday party, but I heard that he was sent to Globen. Still, I couldn't help a few tears of joy when I watched the rerun today. It was so beautiful and perfect! I'm glad there was a rerun so that you got to see that fantastic moment....yes I was feeling very emotional last night too. It's such a beautiful song.